Though I refuse to wish my days away, I am dreaming of dirt season. Each day I watch the snow banks recede (or loom larger) and imagine the bulbs that I planted last fall begin to tingle with life. I can imagine the glossy blooms like plump scoops of pastel sorbet – hyacinth, tulips, and crocus – gracing our breakfast table in vintage milk glass vessels perched atop my great-grandmother’s lace doilies. In addition to indulging in visions of frothy blossoms, I am researching new vegetables to grow. While in the past we have had good luck with tomatoes, squash, beans, and peas – this year John and I are taking gardening to a new level with a 32×70 foot hoop house. While it is exciting to be able to extend our growing season, it is a bit intimidating as well. 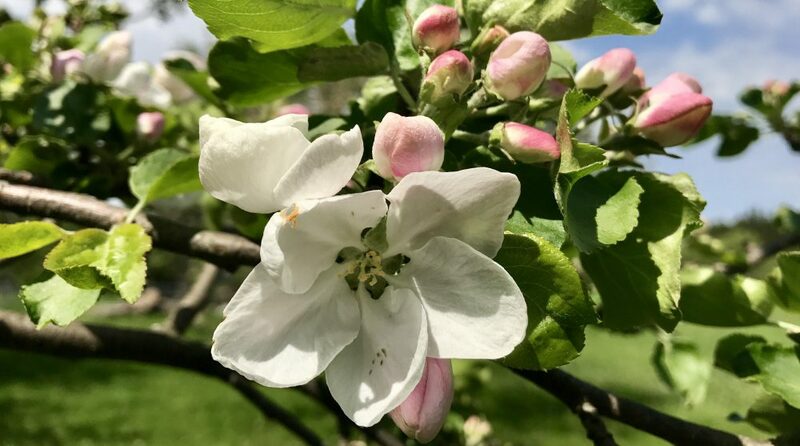 I hope to share some of our trials and tribulations on my blog for others who want to grow more of their own food. Since John and I have an affinity for Brussels sprouts, they are on the top of our to-grow list. While the health benefits of cruciferous sprouts are plenty (Brussels sprouts contain many phytonutrients that promote our health by protecting against cancer and fighting cholesterol), the writer in me marvels over the names of different varieties of vegetables. Even Brussels sprouts are poetic when lavished with titles like Jade Cross, Oliver, and Valiant. 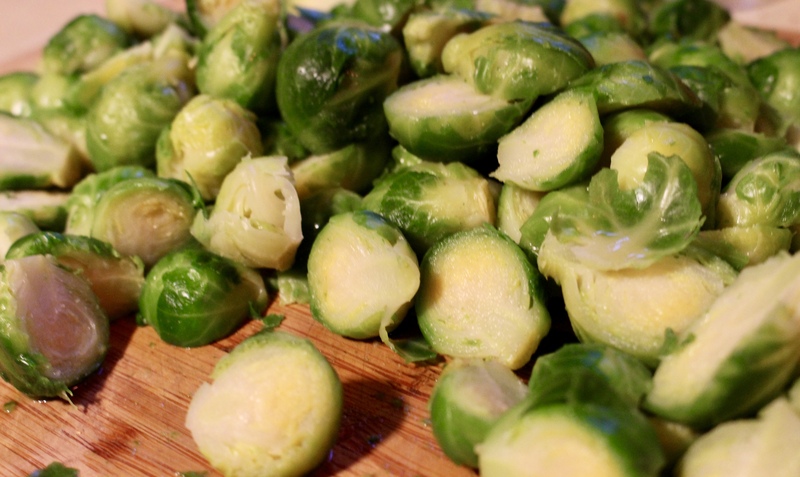 As with much fresh produce such as kale, cabbage, and broccoli – the health benefits of Brussels sprouts are heightened when they are lightly steamed. However, John is wild about my roasted Brussels sprouts. 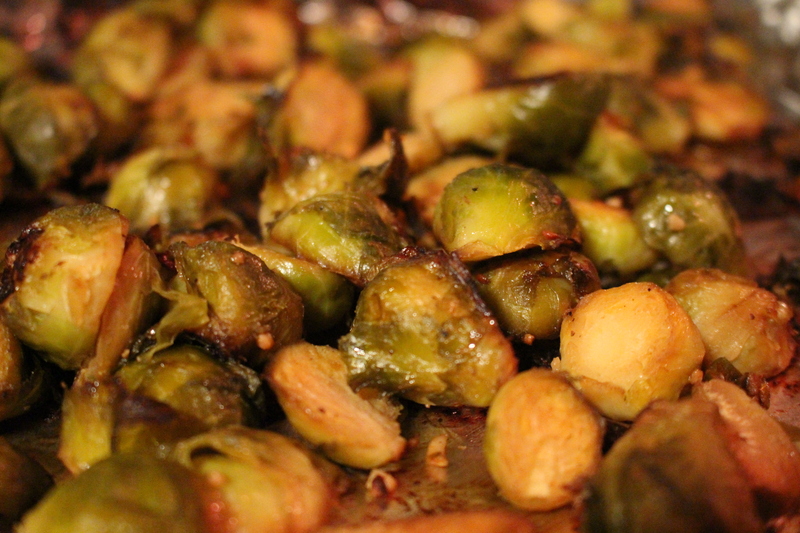 The roasting process caramelizes the sprout and makes them sweet and savory at the same time. For this recipe I decided to incorporate another one of John’s favorites sweet potatoes minus the globs of butter, brown sugar, and marshmallows (sorry, Sweetheart) and a homemade Pomegranate Vinaigrette dressing. 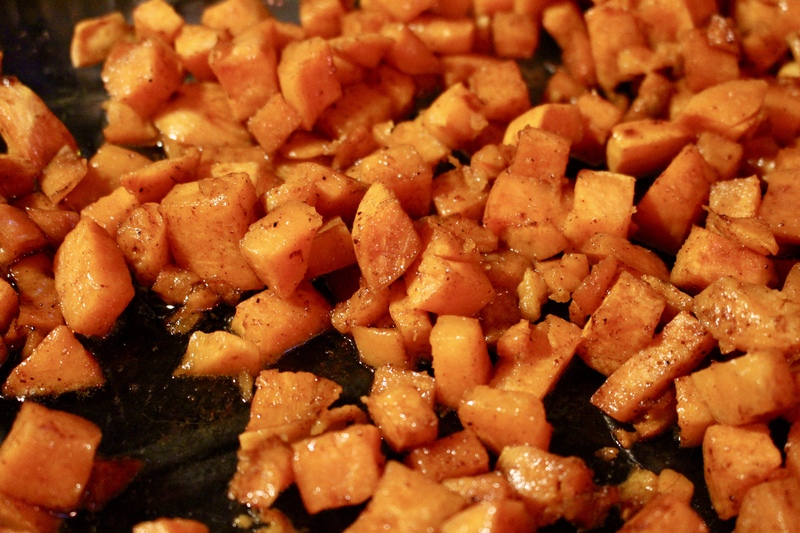 To roast the sweet potato (I used two large potatoes), cut into small cubes and toss in a Tablespoon of oil, a teaspoon of cinnamon, and a dash of salt and pepper. 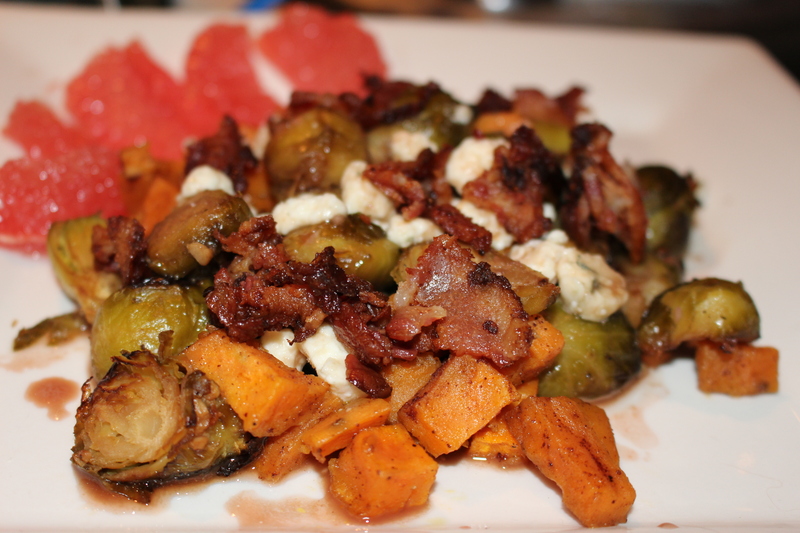 I roasted the Brussels sprouts and sweet potatoes on separate sheets since the potatoes take slightly longer. Roast Brussels sprout at 400-425 degrees for 30 minutes (depending on oven) and the potatoes for 45 minutes. Turn both at the midway point. 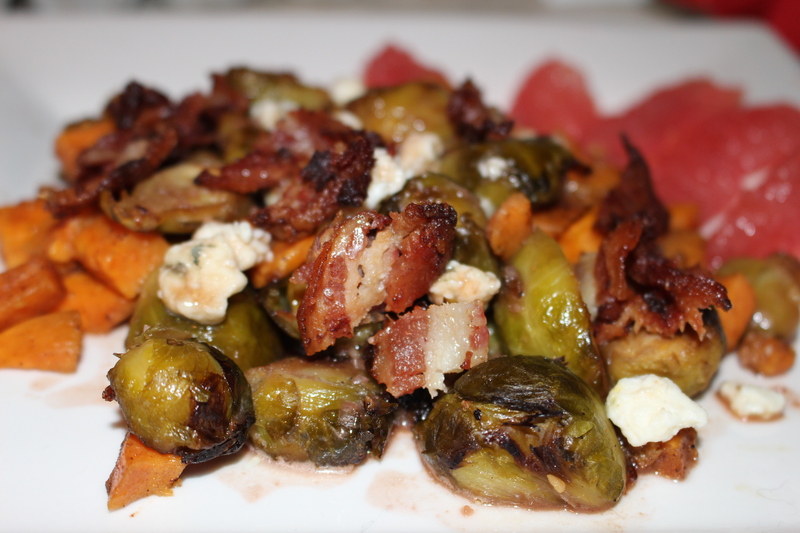 This dish can be made ahead and the sprouts and potatoes can be heated if you want to serve warm. 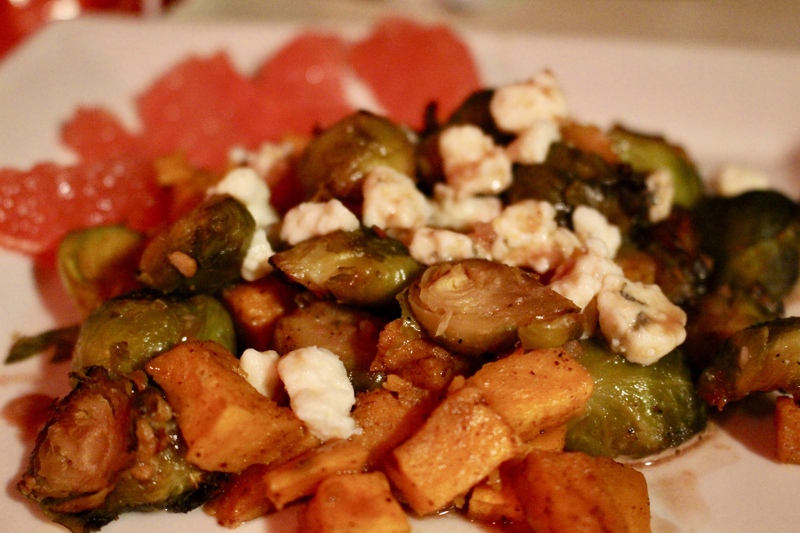 Arrange the Brussels sprouts and potatoes on a plate and add a few grapefruit segments. Sprinkle with gorgonzola cheese (blue, feta, or goat cheese make great pairings). Drizzle with a couple Tablespoons of dressing and sprinkle with extra crisp bacon or walnuts. 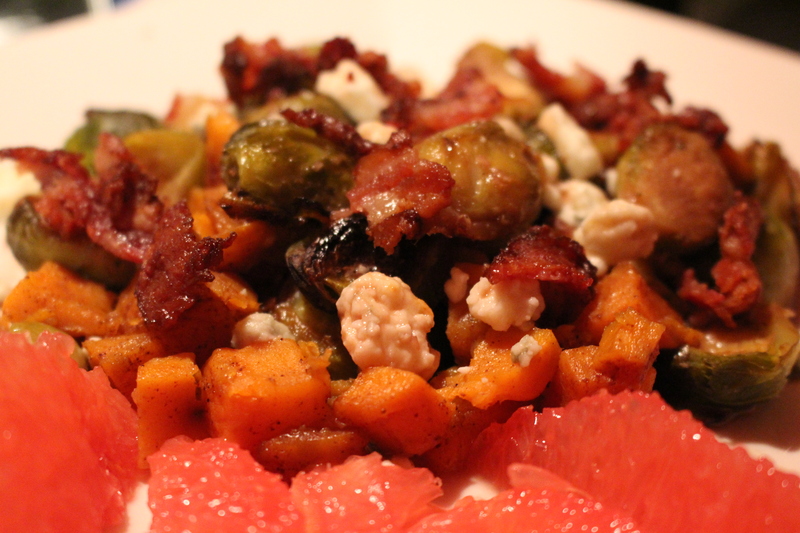 Since my husband eats meat, I serve his with bacon, and I like walnuts or almonds with mine. This dish can be served as a salad or side, and is delicious warm or cold. 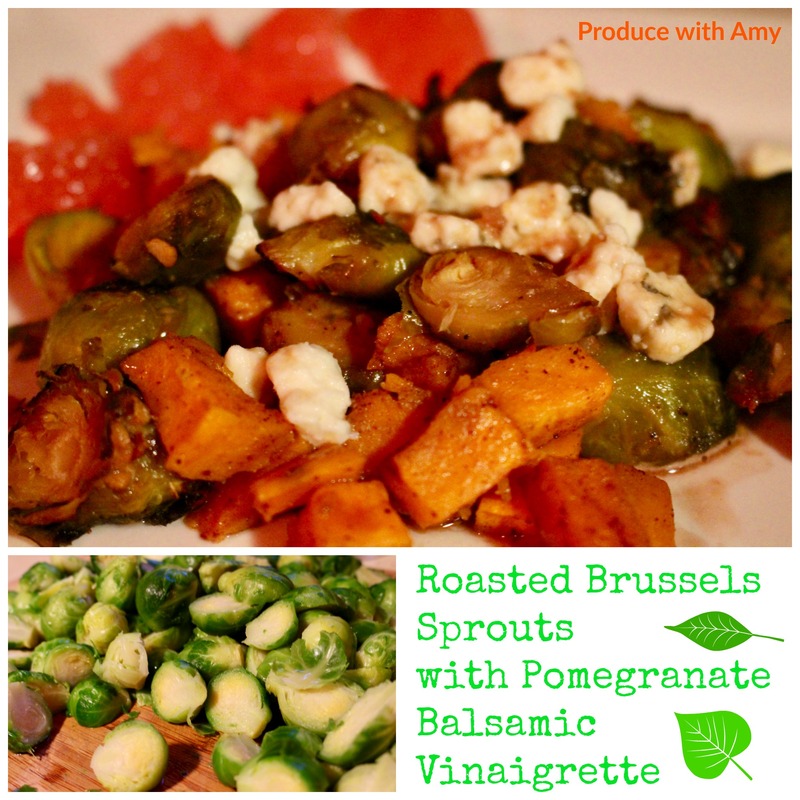 While fresh Brussels sprouts would be preferred, I used frozen – which makes this a versatile offering year round. Incidentally, frozen vegetables are healthy because they are flash frozen at the peak of ripeness. For other seasonal twists on this recipe — serve with roasted cranberries, crisp apples, or fresh blackberries in the fall, in the summer toss with juicy cherries; in the spring early strawberries, and citrus segments in the winter for a splash of color, texture, and flavor. The roasting technique, and the sauce that I use, also turns cauliflower and other vegetables (carrots, green beans, zucchini, onions, mushrooms, tomatoes) into magical creations. The roasting time will be shorter for more tender vegetables such as beans, mushrooms, and tomatoes. Roasted vegetables are versatile ingredients for vegetarians and meat eaters alike and can be served hot or cold and are great tossed into pasta, soups, or as the bed for salads. As I watch the birds puff up their feathers outside our windows, I know that I am not alone when I say that I am aching for green grass, spring flowers, and the opportunity to poke seeds down into a plot of damp earth. Until then, one of the benefits of cool weather is being to enjoy living inside a cozy house with the fragrant aroma of roasting vegetables. It is my pleasure to share this recipe with you and make sure you check out my other recipes for more ways to incorporate a rainbow of produce to your menu.